Mr. Robot’s 5.4 Chip has been Successfully Upgraded! The work-around didn’t work for me, sadly. It isn’t working for me either. New chest from last night’s Flex raid shows up blank as if I wasn’t wearing one. Can you tell me what steps you took (be as specific as possible) and what part didn’t work? Also, you can email me the askmrrobot.lua file that you uploaded and I’ll take a look at it. feedback -at- askmrrobot dott com. Hiya Zoopercat 🙂 I followed the directions as given; except for the new look of the in-game mod, all of it was fairly familiar to me (I used to have to manually load my lua file for BiB). However, the Timeless Isle pieces remained invisible. Can you send me the askmrrobot.lua that you were uploading to the site? I’m hoping to get to the bottom of this! feedback -at- askmrrobot dott com. Send me your character name/realm and I’ll see if it loads. A lot of ppl are having problems (I think a lot of ppl got stuck in a funky state when the patch launched). Try using a different browser or clearing your cache too. w00t to legendary cloak loading for my healer (disc priest for reference) love you guys. Can you save what you are looking at (green save button to the left of your character name)? Send me the url it generates so I can see what is going on with your case. What if your addon isn’t picking it up either? I got Do-tharak: the Swordbreaker in a drop yesterday off of Primordius. It should be in the armory, because it’s Primordius in ToT. But the armory doesn’t have it. 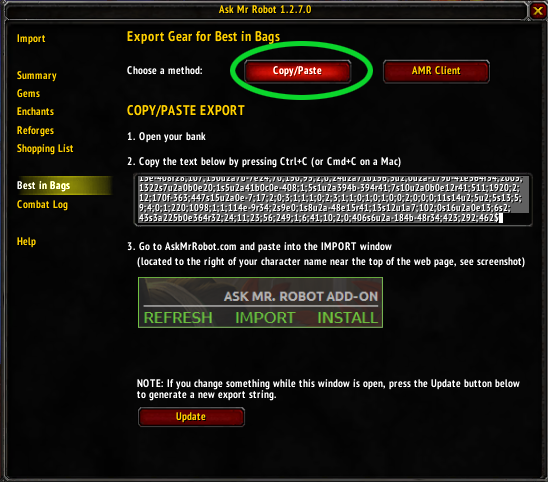 I also have the askmrrobot addon and it’s not importing either. I know I’m relying on addons too much, but I feel I can’t respec. It even dropped my ilvl when I equipped it instead of raising it. Such a headache. I was going to use the pawn addon, but pawn also doesn’t see it, so the respec suggestions it gives ignore the item’s stats. Did you actually watch the video or are you just typing random words in hoping they make sense? I’ll see if something funky happened to that item in the patch. Can you post the text you tried to paste, along with your character name and realm? That string worked for me when Tojaks was loaded. Can you try clearing your cache and see if you still get the error? i thought you had did something to get it, cause it started working yesterday. If the character hasn’t been loaded on our site before, the workaround won’t work 🙁 It only works for cached characters. What is your character name/realm? I’ll see if I can work any magic. weli i can load my character on Eu – maelstrom on armory – but the eu – maelstrom aint on the list on ur page, so i cant load my character ? Crazy!!! Can you link me to your char on the armory? Is this a new realm, or did it fall into the nether in our list somehow? New character, armory broken for our realm. I’m a premium user with the addon, is there a way to import if my character has never been loaded on the site? Hi all, I’ve been off wow for a few months, and have tried to catch up on the threads etc. I have characters on horde on Ragnaros and they load fine, but I can’t load any of my Alliance characters on The Maelstrom. I had them loaded on AMR before I stopped playing… any thoughts or tricks would be most welcome! It looks like they are affected by a server merge and they aren’t showing up in the armory api. We have to wait for Blizzard to fix it, but they are usually fast about it. Make sure you have the most recent version of the addon, it sounds like you have an old version. Hi there, I tried to get on Mr Robot for my Warlock Vuraxxus-Frostwhisper but I physically can’t get onto it on the AskMrRobot website, It just says character not found. How do I load it up so I can get my reforges and everything fixed via the import tab of the addon?